The ancient fishing village of Corralejo, on the Canary Island of Fuerteventura, has turned into a surfers paradise over the last decade. It has grown into a medium size tourist destination but it hasn´t lost its charm. You might fall in love with this place as a non-surfer, or you could be a surfer wondering what to do on a ´day off´ from surfing. Surfer or not, either way you will enjoy the ´board vibes´. It´s one of these places where you might see a waiter in uniform on a skateboard, simply because that´s his way of transport around town or to his job. Being in Corralejo reminds me a lot of my time living in Byron Bay, Australia, with many surfers and more conscious people in regards to keeping the oceans clean. Most people come for a one-week holiday to Corralejo, but a week is actually not enough. Corralejo is definitely a destination which a lot of people come back to, just because they got hooked on the relaxing vibe, the surfing or they want to try another type of surfing. Another reason might be that they couldn´t do all the things they wanted to do while they were here. Corralejo has something to offer for an active as well as for a passive day, with its stunning beaches, a huge selection of water sports activities and its nice bars and restaurants. Corralejo never lost its authentic charm as a local fishing town. Obviously, there are touristic areas with shopping centres and restaurants, like you find on all Canary Islands, but there´s still a local part of town with local places to hang out. Here you still find typical Canary bars to drink a ´cortado´ and children playing on the squares in the evening. This part is behind the harbour ´Muelle Chico´ and if you´re looking for more touristic bars and restaurants, just keep on walking along the seashore where you also find some life music artists playing in the street. Within a short walk or bike ride you´re on the more remote beaches with no, or only a few, tourists. Next to the old part of town, you find the main street which is more touristic with the common shops, bars and restaurants. A bit further away from all this, in the Southern part of Corralejo, you can find more hotels and the shopping centre ´El Campanario´. For me, as a 30+ female single traveller, I made many new friends over here. People come to surf rather then to chill at a swimming pool. I can say that the average visitor is a traveller rather then a tourist. There are not many luxury hotels or package holidays but lots of budget accommodation like surf camps which attract another type of tourist. Also, in contrast to many other tourist places at the Canary Islands, where there´s a split between the tourists staying in hotels or dining in fancy restaurants and the local people mainly living away from that, in Corralejo you can find a mix of locals, tourists and overseas workers all sharing good times together. Corralejo is my favourite place on the Canary Islands. I remember coming here for a few days on my first visit, but getting hooked. Since I have been around here for almost 2 years now, on and off, I became motivated to share some information for people who are looking for a nice, safe and not too expensive holiday in Europe away from the mass stream. Or maybe you have been in Corralejo before and now it is one of those places to come back to yourself and do other things than the ´usual surf´. 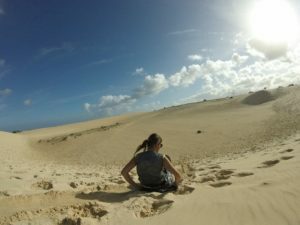 So what are these “other things” to do during my stay in Corralejo? Rent a bike at Volcano Biking and prepare yourself for a bike ride through a volcanic landscape. There are two ways to get there. I recommend to take the route crossing straight over land for the morning when it´s not too hot. This route gives you partly a bike path. Stop for a coffee and treat yourself to a pastry at the famous bakery ´El Goloso´ in Lajares to recharge before continuing your trip. 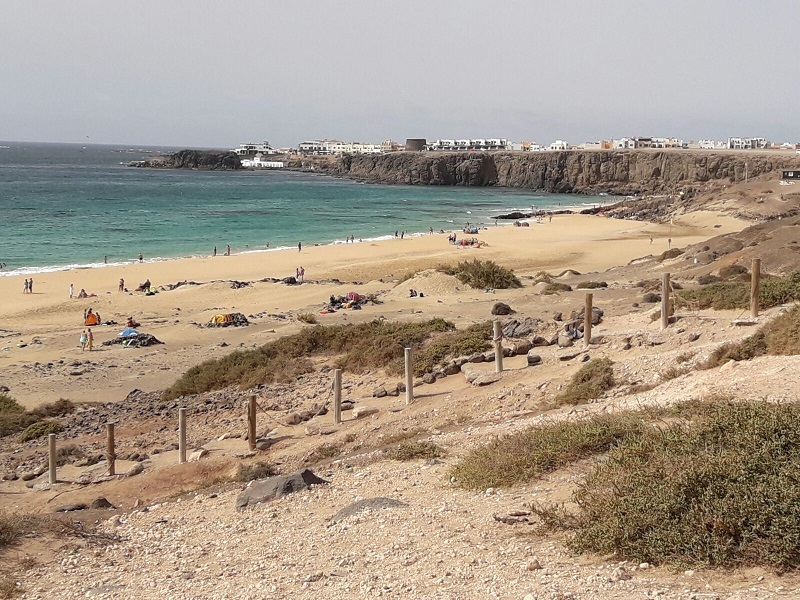 Another biking route from Corralejo to El Cotillo is the off-road dirt track along the north coast where you can stop at some smaller lagoons for a refreshing swim and pass the tiny village of Majanicho. You might like to save this route for the way back when it´s much warmer. Each route is about 20 km (12,5 miles). El Cotillo is a small local fishing village, much smaller than Corralejo. It was an important harbour town for exporting goods during the 18th century, but has turned into a charming small town. It is well liked among the surfing community due to its enormous white surf beach. There are 2 harbours in the village. The old one, ´Muelle de Los Pescadores´ located in the middle of the village, and a newer one, ´Puerto Commercial´ located in the South. 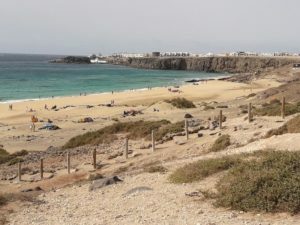 There are bars and restaurants in El Cotillo and if you don´t like the waves on the huge beach, you can enjoy small lagoons with quiet water in the northern part of the town. At the end of the dirt track along the shore, you can find the Cotillo Light House with a small museum inside. Make sure to take enough water with you for your bike ride! If you´re very exhausted, you can always take the bus back and put your bike in the lower storage part of the bus. Keep in mind that at certain times they use a smaller bus which will not fit bikes, therefore you have to wait another hour. A bus ticket Corralejo – El Cotillo costs €3,10 one way. Come back to El Cotillo or stay for the amazing sunsets at this side of the island! If you need a day of peace and tranquillity, go snorkelling at the island of Lobos. Lobos is located in between Lanzarote and Fuerteventura. located only 2 km (1,2 miles) away from Corralejo, you´re there within a 20 minute boat ride. 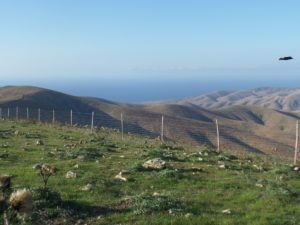 On Lobos you can spot certain endangered bird species and some rare fauna. You can hike the ´Montaña la Caldera´ which has its peak at 127 metres. But the best thing to do is go snorkelling and try to spot a ray or other fish: this area has been a natural reserve since 1982. Lobos Island has almost 14 km2 of coastline so you will definitely find a nice, quiet spot all to yourself. You can either go to Lobos by the regular ferry boat or you can get a ´private taxi´ which is usually a zodiac boat. 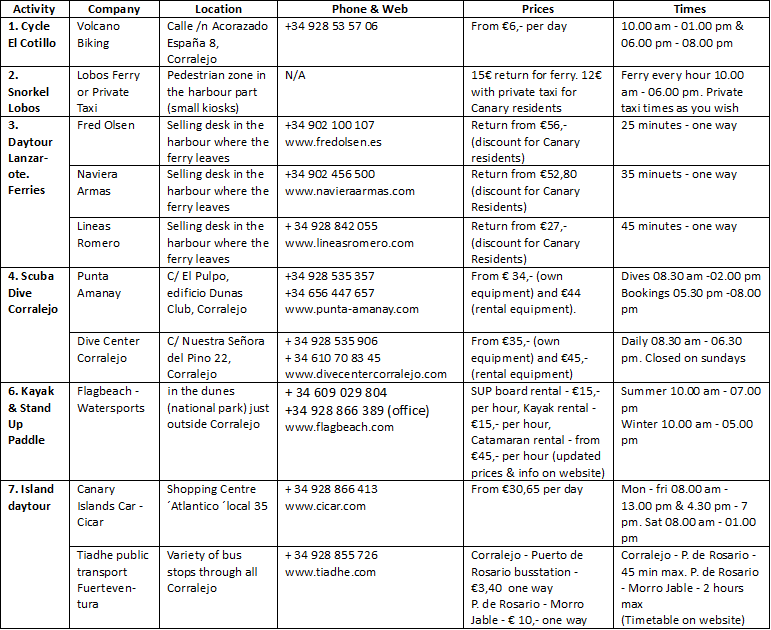 The price for both services are the same, but the private taxis offer a discount to Canary residents. Most private boats provide you with a mask and snorkel but if you take the ferry or are not able to check before, make sure you take a set with you. Ask your hostel where to rent or lent. There´s only 1 restaurant on Lobos, serving paella or fresh fish for lunch. If you would like to eat here you should make a reservation in the morning, upon arriving. There are no shops or other places for food or drinks, so make sure you bring plenty of water! Upon arriving on the island, most people walk down to the left where you have a sandy, white beach, which provides an easy entrance to snorkel, however the beach might get a bit crowded, especially in the high season. In my experience, the snorkelling is much nicer if you walk down the other side. I would recommend to go there if you don´t mind a rocky entrance. Find information and prices for boat rides to Lobos in the break out box. Located only 30 minutes by ferry from Corralejo there is another Canary island: Lanzarote! The ferry arrives in a touristy place called ´Playa Blanca´ where many people entertain themselves shopping. However, I recommend you do a day tour on the island. 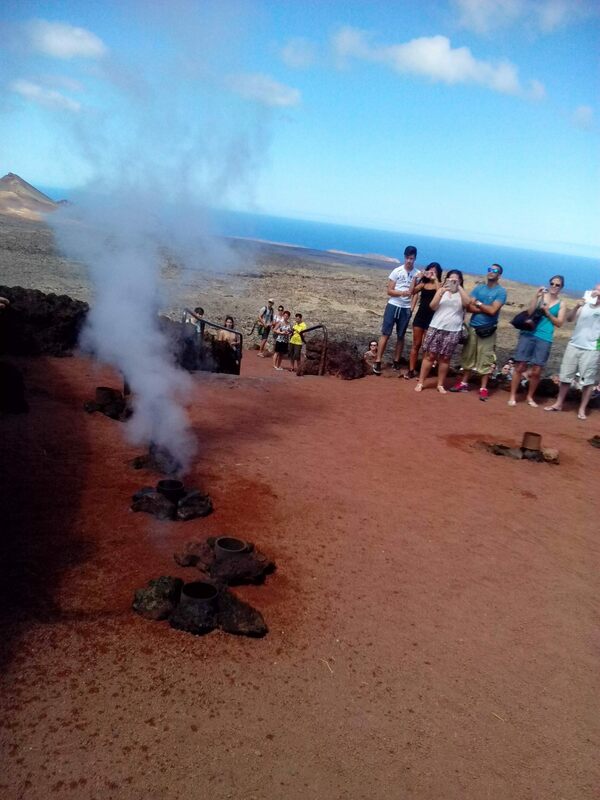 Make sure to visit the Timanfaya National Park where you can eat your barbequed meal prepared on the natural fire of the volcano. If time lets you, go and visit the César Manrique´s creation ´Jameos del Agua´ in the north of the island. 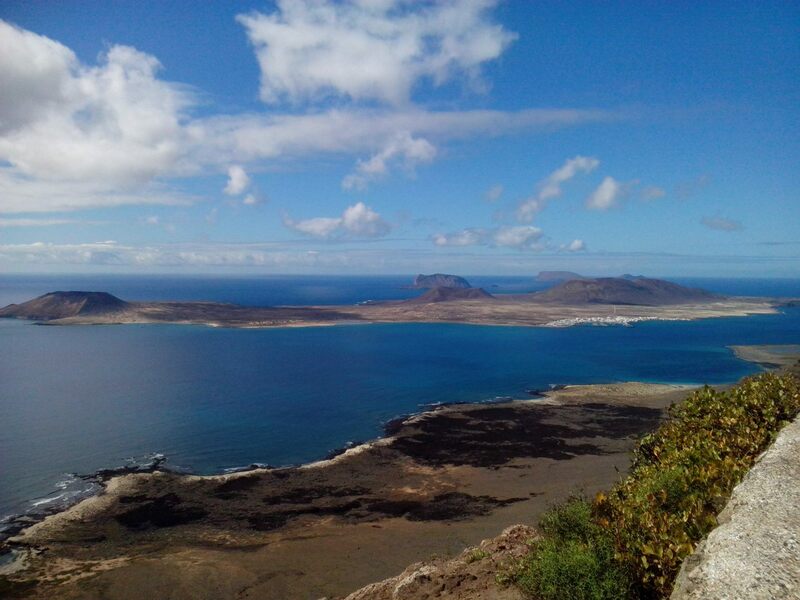 Nearby is also an amazing viewpoint to the small island of La Graciosa. 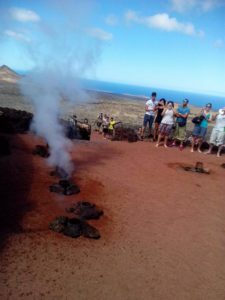 In high season, there can be a long line of cars waiting to enter the Timanfaya National Park, so it would be much better to book an organised tour and you will appreciate the bus passing by all the waiting cars. Other than the two big ferry companies Fred Olsen and Naviera Armas there´s a cheaper and more adventurous option to go with Lineas Romero´s big catamaran. It takes approximately 45 minutes one way. Of course, as a dive instructor, I won´t leave that one out. Most dive spots are around the island of Lobos and there are plenty! Because of the volcanic origin, the dive sites vary and there are reefs, swim trough’s and overhangs. Check what´s underneath the overhangs and keep your eyes out in the blue. Things to see include rays, moray eels, barracudas, spider crabs, damsel fish, octopus, cuttle fish and much more. The Canary Islands are home to the endangered Angel Sharks with most chance to spot one in winter from November until March. The water temperature varies from 18 degrees Celsius in winter to 23 degrees Celsius in summer. There are a few dive centers in Corralejo, but not all of them are having the required paperwork or are offering boat dives, which, in my opinion, is a must for diving the better spots around Lobos Island. I have been diving with ´Punta Amanay´ diving center, which I can highly recommend. The staff are very helpful and they take care of everything, they even wash your gear for you after the dive! They go for a deeper dive at 08.30 am or a shallower one at 10.30 am. Another good dive centre in Corralejo is ´Dive Center Corralejo´, established in 1985. They have a bigger boat. Both dive centres have staff speaking most European languages like English, Spanish, German, French and Italian. My recommendations about scuba diving are coming from an very experienced diver, who has been working as an instructor all over the world. Please click here if you like to read more about my diving experience. 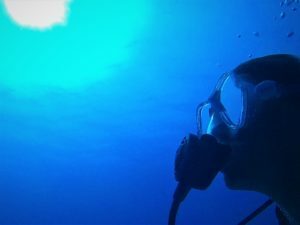 If you´re interested in more articles about diving, please click here. Extend your bottom time by free Enriched Air Nitrox offered by ´Punta Amanay´ diving center (if you´re a certified Nitrox diver). Book in advance during the high season. Sometimes they are fully booked. If you´re not a certified diver yet, take your PADI Open Water Diver Course with Dive Center Corralejo, they have their own indoor swimming pool which is very comfortable and warm, especially during winter. 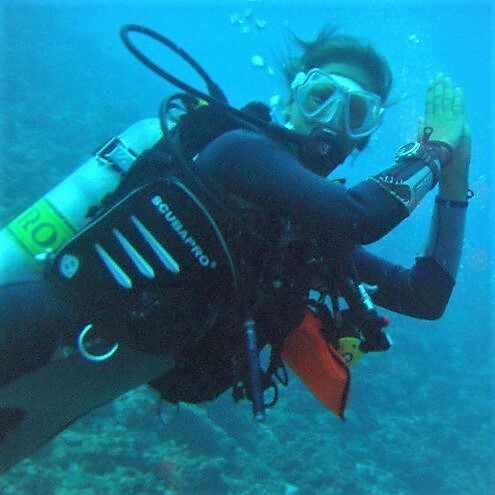 If you don´t like to do your full beginners course, book a ´Discover Scuba Dive´. This includes a part of theory, skills in confined water and an open water dive up to 12 metres. It credits as first part to your Open Water course. The track starts as a side street from the outer ring of Corralejo. 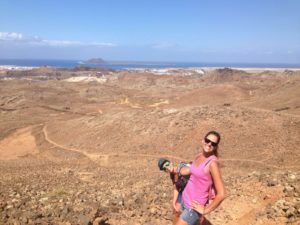 If you walk down south on Avenida Juan Carlos I, away from Corralejo, you can start the track by going off road on the right once you´ve left Corralejo. Use the name of the volcano on google maps to find the exact route. Depending on your hiking speed, you can reach the nice view point within 30 minutes to 1 hour. It gives you a beautiful view of Corralejo, Lanzarote and Lobos. The total distance is about 4,5 km (3 miles). 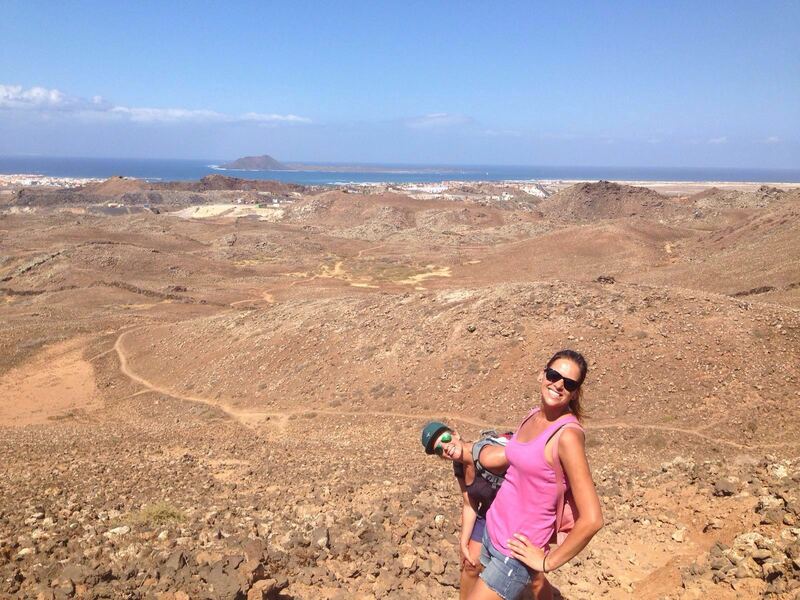 If you´re into hiking, there are more volcanoes with longer hiking routes around Corralejo. Plan your hike for sunset or sunrise because otherwise it may be too hot (especially during summer). Make sure to wear either hiking boots or sneakers, since you might slip wearing flip-flops, especially going down. Take enough water with you on your hike! If there is not enough wind for kite- or wind surfing at Flagbeach, you can still enjoy the day over there. The beach is beautiful and there are many other things to do. Even if your travel partner goes surfing and you´re not into that, you might as well come along to try out some other water sports. But especially on one of those less common days with no or little wind, and if the conditions are good, you can sometimes stand up paddle or kayak to Lobos from there. They also offer catamaran sailing lessons and rental. Flagbeach is situated south east of Corralejo. You can walk to Flagbeach just following the path along the seaside and it will take you around 20 to 30 minutes. It´s located at 3km (1,9 miles) from Corralejo Centre. You can also bike or take a taxi up there. Around Waikiki beach and the other smaller beaches, closer to Corralejo, you can also rent stand up paddle boards and kayaks. See the video below for an impression of Flagbeach. Although the stand up paddle looks very easy, even as a surfer you might have to get used to finding your balance with a board at no speed to start with. It might look boring, but the challenge can be more fun than you expect. There´s a new hype doing yoga on a stand up paddle board. Google it to see what they offer in Corralejo! Make sure to put a lot of sun protection, especially on your face! If it wasn´t enough, the Canary Aloe Vera will help cooling your sunburn. Find more information in regards to Flagbeach Watersports in the break out box. 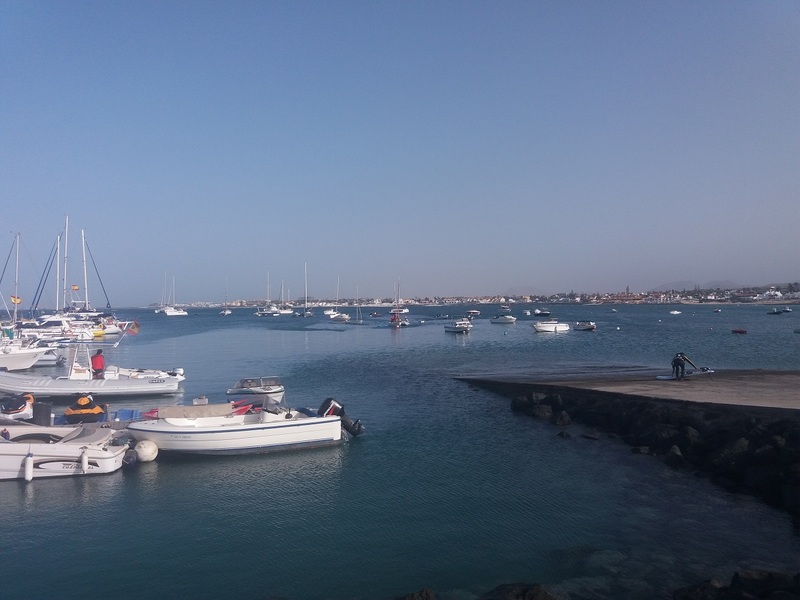 In the south of Fuerteventura you can visit Morro Jable, another charming fishing village with a harbour from which the ferry leaves to Las Palmas de Gran Canaria. You can visit the sea turtle farm or climb the hill for a spectacular view. Close to Morro Jable is Jandia which is very touristic with big hotels and resorts. A worthwhile visit is the spectacular beach in the national park of Cofete. You can drive up there or take the 4-wheel drive public bus, which looks a bit funny for a public bus (see picture). Also the bus stop, in the middle of the national park, is worth taking a picture. Whilst discovering the south you might as well check out the lagoon in Sotavento, famous for wind- and kite surfing. In the middle of the island, you can visit the old capital of Betancuria with its old houses and restaurants. The town got founded in 1404. Betancuria once was the capital of the ´Kingdom of the Canary Islands´ and later of Fuerteventura, till 1834 when Antigua became the capital. You can visit the Santa Maria church and museum too. Combine Betancuria with a visit to Ajuy. Ajuy is a small village at the west coast and is famous for it´s old rock formation, which is said to be more than 170 millions years old. There´s a small black sand beach, a restaurant and interesting caves. If you would like to see a lot of places in 1 or 2 days, I can recommend to rent a car and go at your own pace. 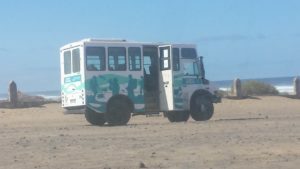 Almost all of the places are reachable by public transport but you have to keep in mind that sometimes the buses go not that often and if you miss a connection you end up waiting for a long time in Puerto de Rosario. If you decide to go by public transport to the south, keep in mind that the public bus to Cofete only leaves 10.00 am and 02.00 pm from Jandia / Morro Jable and return at 12.00 am or 04.00 pm from Cofete. For skate boarding, Corralejo is the perfect spot! There are many bike paths were you can practise your long board skills. If you´re brave enough you can start performing stunts! There is a skate park when you drive into Corralejo, just behind the Guardia Civil. I have been long boarding on a skateboard and just learnt it myself, but if you like to get a longboard class you can book that too in Corralejo. 9) Sandboard the dunes – D.I.Y. This is at your own risk and please use your own judgement for safety! My friend and me have tried it with rubbish bags which was an epic fail. We didn´t go down at all and were just stuck at the top of the sand dune. It was a good laugh, though! We did decide that it will work with a body board or a part of a broken surfboard, however we never tried it so far. But why not pick a nice sand dune in the national park and give it a go! As always, please make sure to take all your rubbish with you upon leaving. 10) Take Salsa dancing classes and go practise at night! I have been taking salsa classes with Chantal Montaldo, and I think she is amazing. She taught and explained me everything from the beginning with the very first steps, including finding the rhythm in the music. She teaches classes to advanced dancers too and is an excellent dancer herself. If you don´t need classes and just like to practise, than go to one of her organised evenings. I used to go the salsa evenings in the kiwi bar at Wednesdays, usually from 10.00 pm they start to put salt on the floor and you can warm up with the Bachata beats. Please check her Facebook pagina to find her information up to date and where she´s organising these evenings right now. You can also contact her directly to book in a (private) class. Here you can see a short (not very clear) video of my results after only 2 lessons. Didn´t get the steps right, yet! Other things to do around Corralejo include Pilates, Zumba, Jiu-Jitsu, spinning and many other sports. You can go to the Barcelo hotel and use the gym, the spa and take a class. I used to go to zumba there and enjoyed it a lot! For yoga, there are many yoga classes and some of them are taught on the beach. 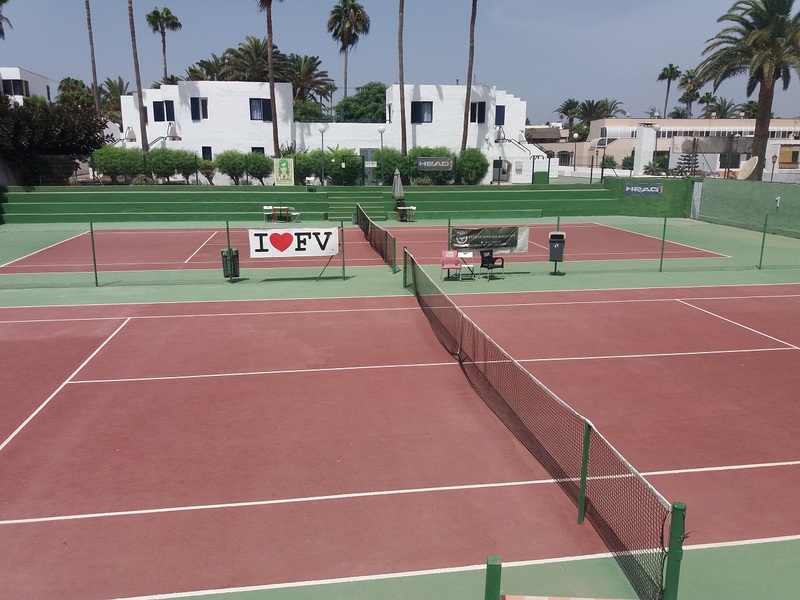 A professional studio is called ´It´s yoga Fuerteventura´, offering 3 classes for € 20,- (all levels welcome). Tai Chi is offered by Hotel Fuentepark, close to Waikiki Beach, at Tuesday morning and Thursday evening. There´s also an option to go horse back riding in Cotillo, which can be nice for sunset. 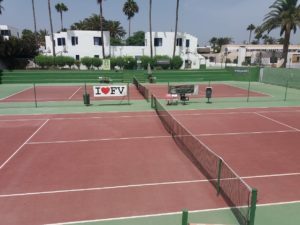 And you can even rent tennis courts in Corralejo. If you need to relax your body after such an active day, book in a massage or do a Reiki session to recharge with Luisma and Karuna Wellness. 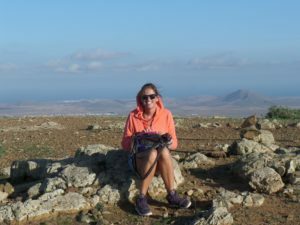 Where to stay in Corralejo? I recommend to stay at Flagbeach´s surf camp ´Sol y Mar´. This has become my ´home sweet home´ away from travelling! For me, it´s one of the best hostels I have ever stayed in during all my travels around the world. 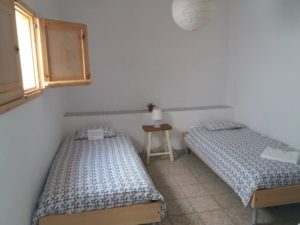 It´s a budget accommodation, super clean and with a amazingly good vibe. There are many single travellers from all ages and because you share the included breakfast together at a big table, you get to know each other pretty soon. 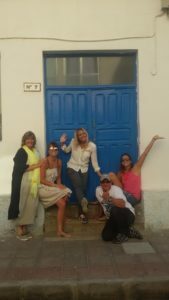 Most of the guests are surfers, so it´s normally quiet during the daytime but in the evening you make many new friends! You can cook or join other guests for dinner, most of the time there´s one group going out together. I have never seen a place with so many repeating customers so I think that says enough. Additionally, they are located in the old part of town, which means that you are within walking distance to bars, restaurants, the harbour and small beaches. 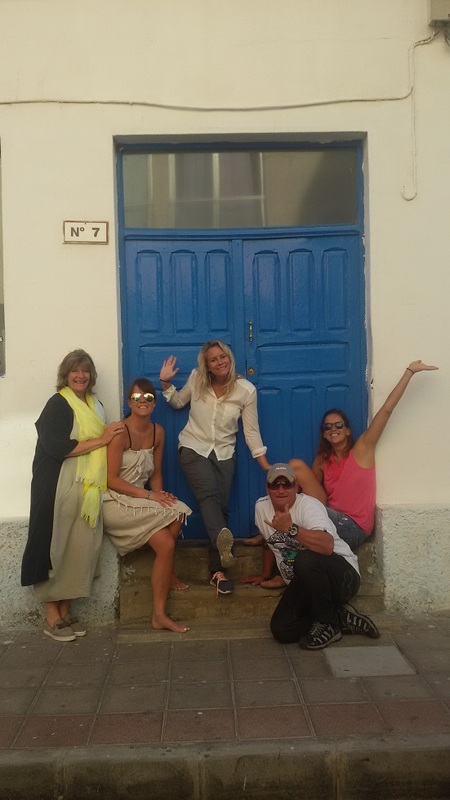 Tips for choosing your accommodation in Corralejo! 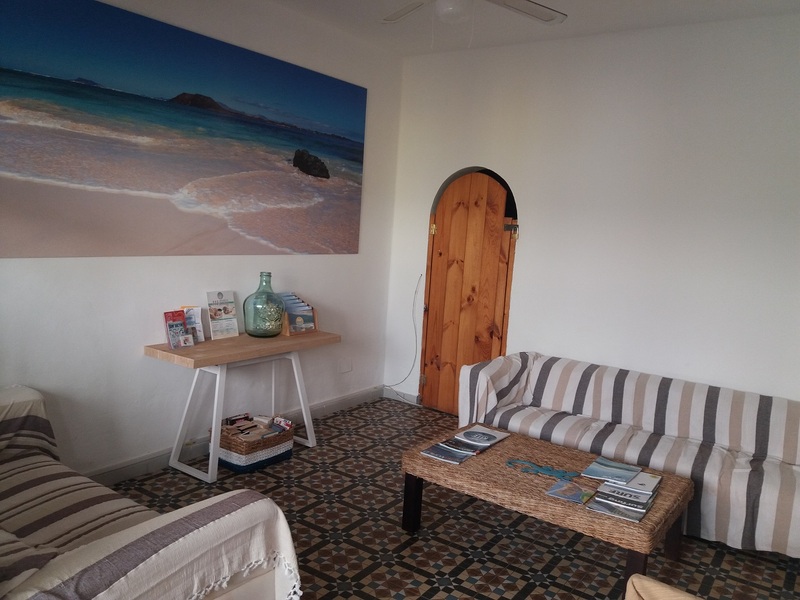 If you´re looking for a more private or luxury type of accommodation, click here for an overview of all accommodations in Corralejo. There are many different types of accommodation including private appartments, hotels and more. Furthermore, Corralejo is full of surf camps and hostel style accommodations. I do recommend to book your stay in Corralejo in advance. Sometimes places are fully booked or you end up with another type of accommodation then you were looking for ie with a more expensive place or a shared room while you wanted to have a private room. Also, it saves you from wasting many precious hours in Corralejo searching for a place whilst carrying your luggage around. If you use booking.com, you´ll get the same price as when you book directly by your accommodation. Almost all accommodations in Corralejo are now listed on booking.com so make sure to book your preferred accommodation in time. Many times you can cancel free of charge within a reasonable time. I am vegetarian and a budget traveller looking for places of the beaten track, so my choice might differ from other people. However, in my experience, most recommendations in the post got appreciated very well by other people or tourists. I recommend vegetarian as well as a non-vegetarian choice. For more information about my style of travel, please click here. With an average flight time between 4 and 5 hours from most European countries, and only 2 hours from Madrid, it´s a very suitable destination for a one week escape. Low-cost airlines like Ryan Air, fly from most European countries. The sun and lovely weather can almost be guaranteed all year round and in combination with excellent wave- and wind conditions, it might become one of your favourite destinations too. Be prepared, once you´ve been here once, you will probably want to come back afterwards to try out all the other things you didn´t try on your last visit. TIP – If you can´t find a cheap flight directly to Fuerteventura, you might find one to the island Lanzarote. 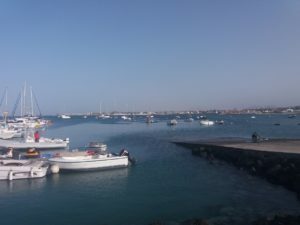 From here, you can catch the local bus to Playa Blanca where you can hop on a ferry to Corralejo. Please make sure your flight times connect to the ferry and bus times or combine your holiday with a stay on Lanzarote. 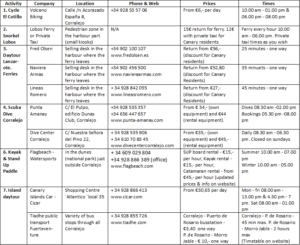 TIP – Use Skyscanner to find your cheapest flight! Feel free to sign up for my mailinglist and you will receive a notification by e-mail once I´ve published a new post. Just scroll down to the pink part and fill in your e-mail address at the top. Rent Bike Copenhagen Reserve best luxury motorcycle rental, bike rental service, rent a christania. Enjoy the best place in Miami via luxury bike.